AIRLINERCAFE.COM - Forums - Zvezda 757 in future??? Forums / 1.0 Airliner Modeling / New Kit & Decal Releases / Zvezda 757 in future??? 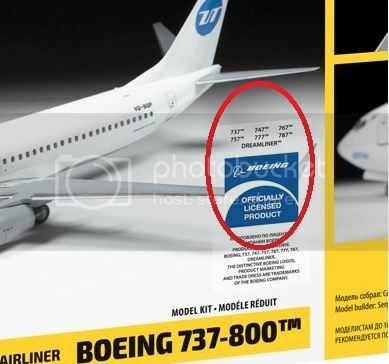 I was looking the new 737-800 box and notice in the back they mention a "OFFICIALLY LICENSE PRODUCT" and besides the list 757, all other is been release. Hmm... I would think that if they have "757" on a label indicating it as an "officially licensed product" then Zvezda would have paid for the right to use "757." And why would they do that if they weren't going to use it?? I await with silent anticipation. I wouldn't read anything into that. That just means they bought the rights to use the name in the package of licensing rights. I'm not aware of any Russian airline that flies the 757, and everything they've done is flown by a Russian carrier. I hope they do, but I'm not counting on it. least a few Zvezda offerings should they become reality. There you go. I've been out of the loop for a long time. Who knows, maybe they will do one next year? Guys, just get the AA 757 kits,they come in two flavorful sizes, 200 nd 300.
can't more disagree on that than anything else. I prefer having a good injection kit of a 727 or 757, no problem cutting a descent kit to a shorter version. So, zvezda - i'm still hoping for a 757! No offence but one shouldn't have to defend themselves for not buying an expensive resin kit. I agree Kurt does a wonderful job on them and I really like building them once in a while (if there's no good injection option available, I must add) but I just like working with styrene more. For each their own, right? I agree. I'm lucky to have a fairly generous modelling budget but even so I have to think twice before buying Authentic Airliners kits, particularly following the collapse of the Pound agains the Euro which is only likely to get worse after Brexit is officially triggered tomorrow. In the right hands Authentic Airliners kits are things of beauty and wonder but personally I don't really enjoy working in resin and for some weird reason AA kits make me nervous. I'd actually rather build an old-fashioned vacform. this is a rew legal requirement from Boeing itself, all licensed products need to show this legal text. Revell ist also introducing those in their products. Please add me to that list, I want a good 757 kit really bad, I hope Zvezda gets our message. Why not talk to Zvezda on facebook directly? They are quite active there. As the saying goes, it would give them a license to print money! If they do it, and they do all three engine types (2x Rolls Royce, 1x P&W), and winglets or normal wing tips, they would have 99% of 757s covered. I would buy half a dozen to start with! You aren't the only one, Jennings! There's got to be something like 30 757s I'd like to build! If I had a nice plastic kit plus a few of the AA kits mixed in ( I already have two), I could be a happy builder for quite some time!! Long live the 75! If Zvezda actually visits here, as was mentioned in the 737 post..... I recommend everyone that wants a 757 chime in here. I have three AA kits unbuilt only because there are so many 757's I have decals for, and want to build. I cannot pick which to do. Now, give me a kit that is quality like Zvezda has proven, at a price point of 30 USD, I am in for a dozen! Kurt, this is no offense to you. It is a matter of the availability, and my spending at any given time. You are always my first choice! Yes please Zvezda make a B757 kit! Is it well right here the 757's lobbying topic ? I'm definitively in if zvezda consider to produce this! If Zvezda reads here and goes for a 757: I'm in for 15+ kits. It had been a long time since I had looked at 757s... In addition to the three engine nacelle types and winglets, there are two distinctly different window/door arrangements. A completely unscientific survey indicates that about 2/3 of 757s were built with the small escape door aft of the wing, while about 1/3 were built with the two over-wing escape hatches. The window arrangement is quite different between the two configurations. It's what's called Murphy's Law in my modeling world. most definitely not least, I recently invested in five Authentic brand 757s. So, there ya go. Expect a Zvezda 757. I'll be in for a couple of kits as well! I would also buy one or two but does that really make a difference for Zvezda? We're talking about injection moulding, not even short-run technology. I've heard they have one of the most advanced injection moulding machines in entire Russia, developing a kit is not just a matter of a few hundred dollars startup costs like a resin kit. They'd have to sell tens of thousands of kits to break even. Twenty or thirty commitments here are just a grain of sand in a desert. Please correct me if I'm wrong though, and if I am and it actually does matter: Zvezda, go for it! It can't possibly hurt, can it? And no, they don't need to sell tens of thousands. Those days are long gone. +1. Plus with the current troubles at Minicraft (no need to discuss the actual quality of the kit), there is currently no injected plastic 757 on the market. With the number of 757 operators over the years plus Zvezda's great recent kits I personally feel a 75 could be a great success. By my count they've got 75+ sold already just in this thread! The development and production of a quality model is very, very expensive. People think that model kits sell far more than they actually do though. And it's not like they have to sell 50,000 units in the first month. This kit will be on the market for decades (potentially). I actually had someone argue with me that they had to sell "over a million" kits to make it economically viable. I'd be surprised if the Revell USS Missouri has sold that many, and that kit has been in almost continuous production since the tooling was cut in 1953.